Are you ready for a card with a hot mess recovery!?!? LOL! The leaves in this one were a tragic mess til suddenly they weren’t. 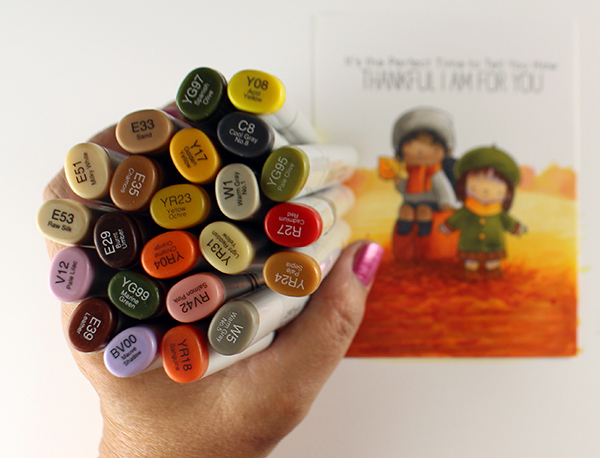 And through the video I’ll talk a little about choosing colors for a nice fall card…and do a little #humanrainbow while we’re at it! Watch the video below or click HERE to see it in HD on YouTube. And while you’re reading…I just want to say I’m thankful for YOU. Thanks for reading my blog. For commenting. For shopping my links. It’s you that makes this all worthwhile! 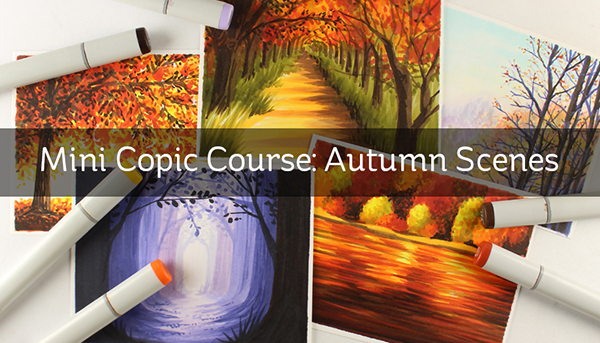 And if you haven’t yet taken the Autumn Scenes Intermediate miniclass….whatcha waiting for? Your hotness and my hot mess are two totally different things. Thanks for keeping it in the video…..love the card! Huge thumbs up. 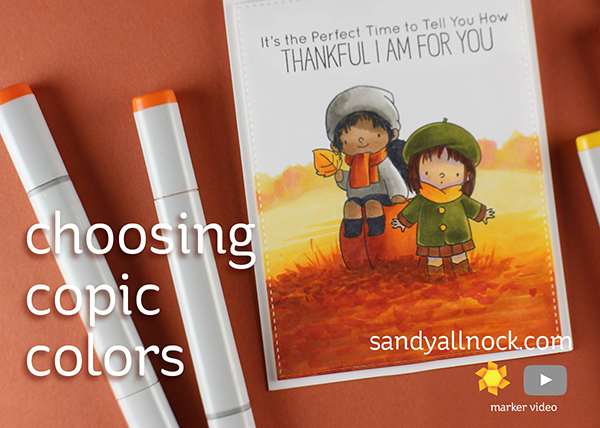 Huge thumbs up my dear with this fabulous autumnal card, . As soon as you layered that colour on, wham ! instant scene. You know all these critical people, I’m presuming they post their masterpieces for us all to judge to & not hide behind keyboards ! Keep your head, & camera, hehe up, I learn so much from you card after card. Thank you. This is amazing!! I thank you for posting when you make a mistake coloring because it is REAL (or I hope it is!!) I like that you were able to fix it too, rather then throw it away after all that coloring. Really lovely card!!! Sandy, You are a magician!!! I love your videos. Thank you for inspiring all of us! Wow this is from hot mess (your words, not mine) to awesome. I love what you did with the leaves on the ground, fallen leaves are a little messy. Your girls are love so great job done! Yup I’m one of those people who always enjoy watching you fix a hot mess Good job! What hot mess? Your results never cease to amaze me. 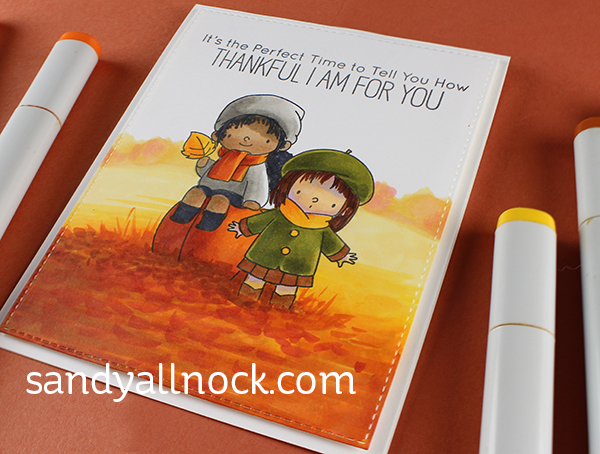 I love this Fall Friends stamp set which quickly became one of my favorites. So so fun! You are so generous with your time ! Oh honey – you haven’t seen a truly hot mess until you’ve seen some of mine! But thanks for the lesson on how to not lose your cool, and recover from something that might have been added to File 13!